My arsenal of haircare products has been increasingly growing as of late, and I've found some great products that really do their job. Between cleansing, conditioning, and protecting these products have a permanent spot in my bathroom cabinet. Bumble & Bumble 'Sunday Shampoo' : I've posted about this product in the past and it's just so good that it deserves another mention. For those moments when your hair just feels weighed down by product, constantly greasy, and dirty this shampoo is your go-to. It deep cleanses and removes all product build up with just one wash.
Verb 'Ghost Oil'* : This hair oil creates glossy locks all while being lightweight and non-greasy. I use this only on the ends of my hair (keeping it away from the roots) post styling to add a bit of smoothness and shine. 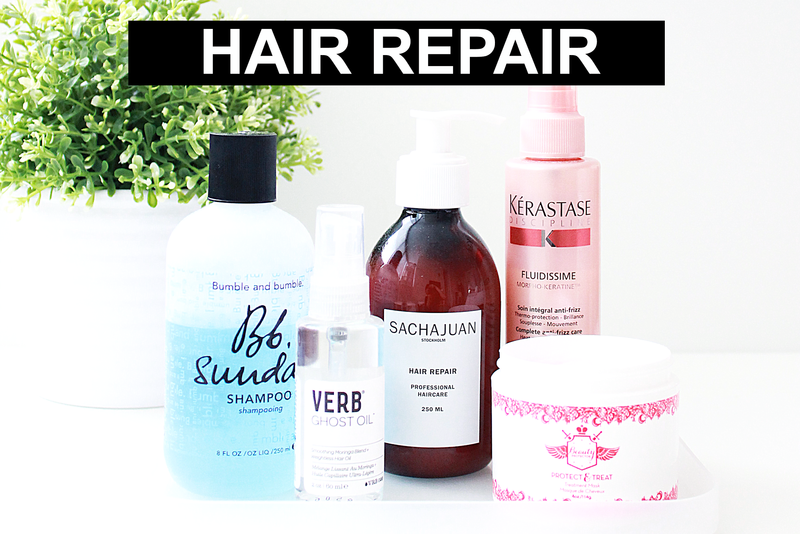 Sachajuan 'Hair Repair' : I use this deep conditioner once a week, leaving it on usually while I shave my legs. It's a quick deep condition, but it packs a big impact. My hair is instantly softer and smoother post use. This is one of those products where you can see immediate results after use. Kérastase 'Fluidissime' : My stylist actually recommended this product to me a few months back to use post-hair wash to help with frizziness and to heat protect. I spritz this all over damp hair before blow drying or air drying. Beauty Protector 'Protect & Treat'* : Last but not least is the hair mask that I do about once a month or so. This is one that stays on for much longer and really works to hydrate and nourish the hair. Filled with things like Argan oil and honey it helps to cut back on split ends. Now your turn to spill...what are some of your favorite hair product?